Paul had a sweet tooth for Muscadine grapes as a boy in Georgia. I have been growing Cabernet Sauvignon grapes at our hillside vineyards since 1996. In 2009 we planted Napa Valley’s first Muscadine vineyard. In 2012, we launched our commercial label, offering both Cabernet Sauvignon and Muscadine wines. My wife and I hadn’t planned on moving to Napa Valley or getting into the wine business, but as tourists we fell in love with a vineyard for sale on a trip to visit our daughters at Stanford in 1996. Having grown up on a farm in Georgia, it was nice to get back into the seat of a tractor and out from behind a desk. I have always had a sweet tooth and that includes in my taste in wines. I grew up eating Muscadines off the vine in my Georgia backyard, but I realized the only way I was going to get a sweet Muscadine wine out of Napa Valley was to grow the grapes myself. 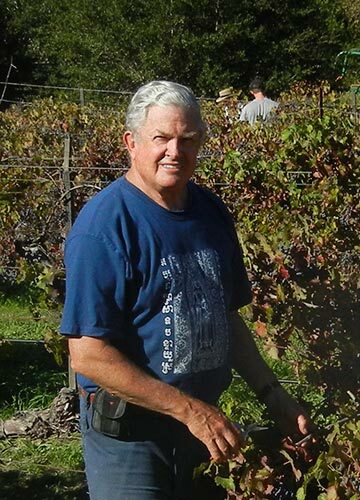 Paul Saviez’s knowledge and experience has guided our Cabernet vineyard, and I have enjoyed working with Kenn Vigoda, who took up the challenge of making Napa Valley Muscadine wines. Managing the vineyard has been a mix of trial and error and experimentation, but I am really pleased with how the vineyard has matured. Our inaugural harvest in 2012 produced two barrels of wine. By 2014 we had more than doubled our harvest. As a new label, we face the same great challenge every new winery faces – distinguishing one’s self from a sea of well-known, high quality Napa Valley wines. Building our brand will take some time. Presently only four acres of our 54-acre estate are dedicated to viticulture, minimizing our footprint on the land and leaving plenty of space for wildlife to travel freely for food, shelter and water. We have enjoyed learning the ropes of this new industry with our children. I would enjoy sharing my wines with my father, who was killed in WWII; and his father and my maternal grandmother, who both had significant influence on my life.